Danny Quartermaine after winning the 64kg title in the Midlands National Amateur Championships at Donnington. 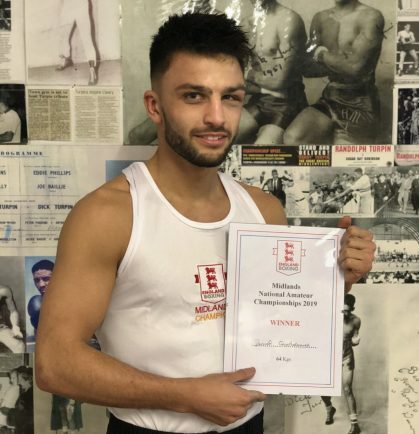 CLEARY’S boxer Danny Quartermaine won his sixth Elite Midlands title on Sunday at the Midlands National Amateur Championships in Donnington, where he impressed over a two-bout weekend. In the opening match, he boxed Lions ABC’s Ryan Howells, forcing a stoppage in the first round, before coming up against Solihull boxer Dave Jones in the 64kg final. Quartermaine capitalised on the slow speed showed by Jones to switch his stance and move around the ring, demonstrating his explosive jab to do damage to his opponent. It was labelled as one of the Leamington boxer’s best displays to date, in over 80 career bouts. He now moves into the pre-quarter-finals in Nottingham on Friday in the hunt for further success. Elsewhere, Jake Finch was also in action on Sunday, where he navigated Darius Rabenda of Redditch ABC, but found Scott Melvin (Eastside ABC) a hurdle too far. He did however impress despite losing out, with a number of experienced coaches commenting that he did enough to win the bout. His next challenge is for the Central England elite belt, which he will be fighting for later this month.